This fresh, flavorful salad is delicious! This is a lot of work for a salad, so I use the rice, beans, meat, salsa, and guacamole for a hot Mexican dinner one night. The next night I make the dressing and use the leftovers for this salad. 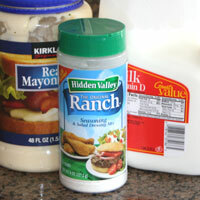 Prepare Ranch dressing by mixing the milk, mayonaise, and 3 T ranch powder. 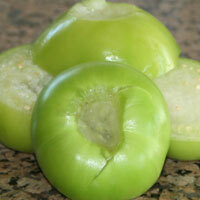 To roast the tomatillos, heat a small skillet over med/high heat. Lay foil on top so the tomatillos don't stick. Husk and wash the tomatillos. Cut the top core out and half them. Place them skin side down in the pan. Roast 3-4 minutes, they should be browned and just starting to blacken. Turn them flesh side down and roast until tender all the way through. Seed and chop the jalapeno. 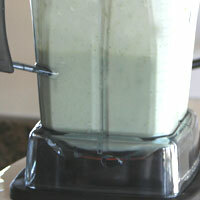 In a blender add 1 cup Ranch dressing, tomatillos, jalapeno and sugar. 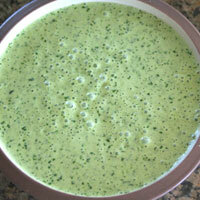 Add the cilantro and blend until cilantro is fully incorporated, but flecks remain (don’t make it completely smooth). Add lime juice to taste. Cool and refrigerate. You can use prepared Ranch dressing, but it isn't as good. This dressing is best served cold. If it's made last minute, cool it off in an ice bath. 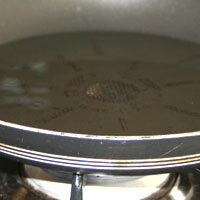 Heat ¼ inch vegetable oil in a skillet over medium heat. Cut 1/4 inch strips from 2 corn tortillas. Place in hot oil and fry until golden. If they brown they are overdone. If they brown really fast the oil is too hot. 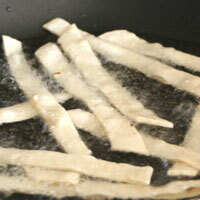 Remove from oil and place on a paper towel. Sprinkle with salt to taste. 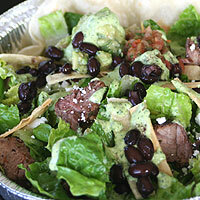 In a large bowl, mix the lettuce, beans, rice, and meat. Toss with dressing. Place tortillas, if using, on four large plates. Divide salad on top of tortillas. Top each with tortilla strips, salsa, and guacamole. Serve with a lime wedge on the side. Enjoy! 1. Prepare the (1)Ranch dressing by mixing milk, mayonaise, and Ranch powder. 2. 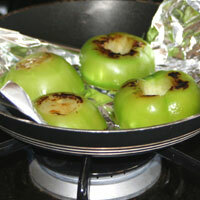 To roast the tomatillos, heat a small skillet over med/high heat. Lay foil on top so the tomatillos don’t stick. Husk and wash the tomatillos. Cut the top core out and half them. Place them skin side down in the pan. Roast 3-4 minutes. They should be browned and just starting to blacken. Turn them flesh side down and roast until tender all the way through. 3. 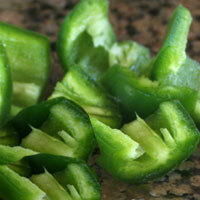 Seed and chop the jalapenos. 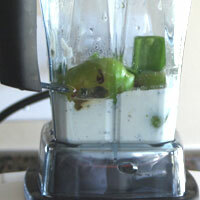 In a blender add 1 cup ranch dressing, tomatillos, jalapeno and sugar. Blend until smooth. 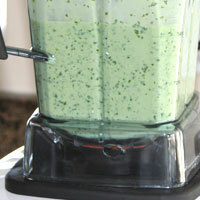 Add the cilantro and blend until cilantro is fully incorporated, but flecks remain (don’t make it completely smooth). Add lime juice to taste. (2)Cool and refrigerate. 5. 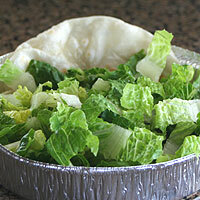 In a large bowl, mix the lettuce, beans, rice, and meat. Toss with dressing. 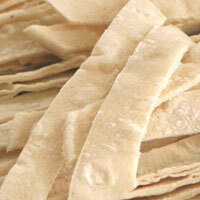 Place tortillas, if using, on four large plates. Divide salad on top of tortillas. 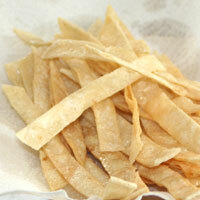 Top each with tortilla strips, salsa, and guacamole. Serve with a lime wedge on the side. Enjoy! 1. You can use prepared Ranch dressing, but it isn't as good. 2. This dressing is best served cold. If it's made last minute, cool it off in an ice bath.